EMC Planning Group prepared the community design plan and specific plan documentation for an approximately 640-acre site within the City of Riverbank. 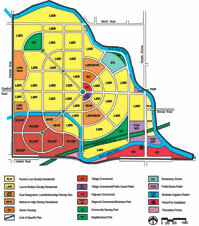 The design concept employs elements of “new urbanism” including a central neighborhood-serving commercial area linked by pedestrian-scaled roadways to the residential areas and other neighborhood serving uses including an elementary school, two neighborhood parks, and a large research/development park. A major emphasis of the plan was placed on providing recommendations for the character and configuration of new homes and retail areas that would foster neighbor interaction.